Criterion Games is seriously considering making one of their greatest creations for the Xbox 360, Burnout Paradise, backwards compatible with the Xbox One. Burnout Paradise, an unparalleled open-world racing experience might get that precious backwards compatibility on the Xbox One. 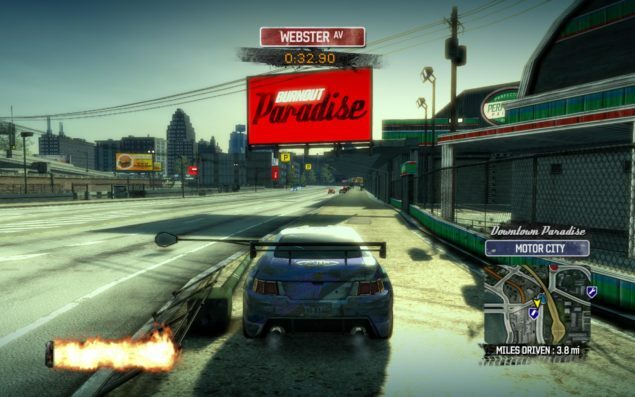 While you can certainly enjoy Burnout Paradise on the PC at the moment, that wouldn’t be nearly as fun as reliving the absolute joy of destroying Paradise City, or legitimately racing, on the console. Plus why spend the extra money if you happen to have the Xbox 360 disc still lying around? Burnout Paradise is a fantastic game, the fifth in a series of what are known as “gonzo” racing games. You can follow your own path and explore the city and all the events and races on offer at your own pace, or just mess around and make things explode as you see fit. Backwards compatibility through the emulation of the PowerPC architecture isn’t necessarily a terribly difficult task to accomplish, though the sheer amount of different API calls means that good emulation can only be achieved by going through it with a fine-toothed comb to ensure that everything runs as efficiently as it should and that no errors occur. Microsoft surprised the world when it announced at E3 that they would include backwards compatibility with certain Xbox 360 games as part of an update. Not they’re committed as ever to increasing that reach, providing assistance where necessary to ensure that backwards compatibility is a a value added feature for the future. Just because Microsoft has a helping hand doesn’t mean that all titles are going to play like they should. There will always be a measure of overhead that prevents performance from sometimes being at a natural and native state. Mass Effect 3 has been shown to run far more poor than it does on the 360, begging the question of whether this is truly the right direction.